Here comes the bride and groom! 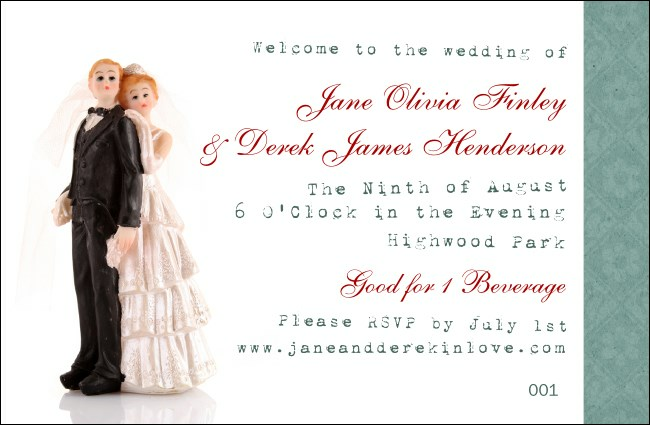 Add some whimsy to your wedding and manage your bar traffic with Vintage Bride and Groom Drink Ticket. Featuring a photorealistic image of a matrimonial cake topper, this securely numbered drink ticket solemnly swears to keep your guests hydrated and your wait staff organized. A beautiful wedding begins with TicketPrinting.com.